The proper disposal of ewaste (electronic waste – old TVs, stereos, computers, faxes, printers, etc) is becoming a significant issue. These products contain toxic materials such as lead, cadmium, beryllium and brominated flame retardents. People are upgrading to flat-screen TVs in record numbers, leaving them with huge unwanted CRT TVs taking up space in the garage. The rapid rate at which computers, mobile phones, DVD players, games consoles, GPS units and other gadgets are released and then obsoleted means they’re piling up around the TVs in the garage too. So what can you do with this “junk”? At the moment, not much. Waste centers are starting to charge to take these items, because they have to be handled separately from the rest of the waste stream. Most charities are refusing them as donations, since they already have excesses of unwanted old gear. My employer recently had to get rid of several pallets full of old computer and electronic equipment that had no value to anyone. To their credit, they have a policy that it must be disposed of ethically. It turned out to be very difficult to find anyone to take it, though. Our company disposal policy won’t allow it to be sent to developing countries for recycling, due to concerns about massive pollution in poorer areas and the use of child labour. Disposal options within Australia can be expensive and are hard to find. This whole e-waste issue came up as a topic for discussion at the last Kiama Sustainability Advisory Committee meeting. There’s a real fear that with tips charging extra for disposing of these items and Councils refusing to take them in the normal kerbside cleanups, people will start dumping them illegally. 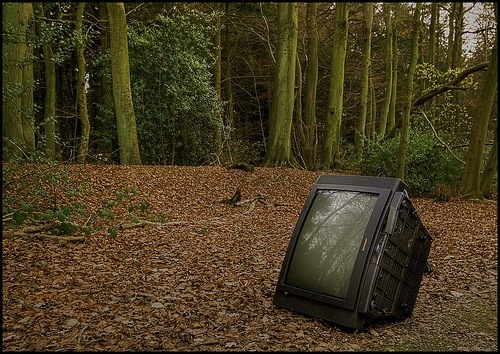 In fact, in just the last three weeks I’ve seen 5 different TVs dumped on the roadside – 3 around Wollongong, 1 in Dapto, and 1 on Jamberoo Pass. Kiama Council is left with a real problem on how to deal with ewaste. 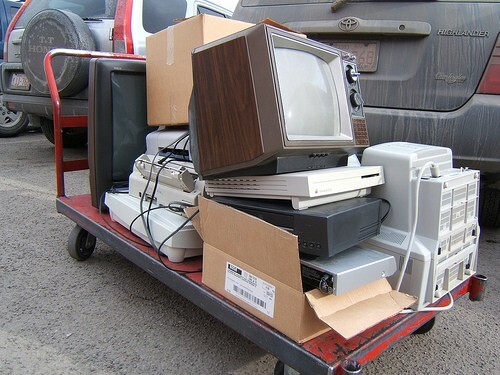 Sure, the Federal Government is planning a nationwide ewaste collection solution by the end of 2011, but that’s a long way off and we all know how common it is for government solutions to be delayed. Should Council collect ewaste from residents and store it in a warehouse somewhere while we wait for the national scheme? There are serious health and safety issues with handling and stacking all that toxic waste, not to mention the cost involved. And if the Federal ewaste program gets delayed or cancelled, Council will be left to dispose of the ever-growing stockpile at its own cost. Alternatively, Council could collect ewaste semi-regularly (say, twice yearly) and pay to have it recycled. The cost is significant, though, and funds are already scarce for Council. 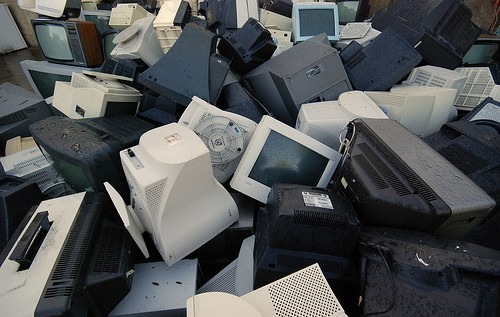 Or perhaps Council could just run an awareness campaign about the upcoming 2011 Australian ewaste disposal scheme, and ask people to be patient and store this stuff for a little while longer. Which brings me back to the title of this post: So what can we do with old TVs today? What do you think? Do you have any good ideas for other ewaste options? Please post them in the comments below! First, try and reuse the functioning usable materials by offering them for free. Freecycle is often a great avenue for this. @Jason: That would be a good thing to include in a Council public education program. The Illawarra Freecycle seems to be fairly active – although I’m not sure what would happen if a hundred people put old TVs on there in the one week! Last weekend, I drove past an advertising sign in Albion Park that had two TVs dumped behind it. Three hours later on my way home, there were 5 or 6 TVs there! So people are dumping, and they’re brazen enough to do it in broad daylight. I think this is a problem that’s only going to grow in coming months. I once saw a band called Man or Astroman? Their lead singer used to run around with an old TV set on his head. Maybe he’s in need of replacing his old one? @Martyn: Sounds cool! I just Googled them up and found these old photos. Although, to be fair, with the amount of TVs we’re going to be faced with we’ll need every band in the world to start wearing TV helmets :-). There was a great radio national piece on this just recently: http://www.abc.net.au/rn/lifematters/stories/2010/2843193.htm. They mention resources which can be recovered from old TVs but generally don’t cover the shipping it off to the third world factors. Cheers for the tips… Just bought a new TV at the boxing day sales… and I did not have the first clue how to give it away.